To mark the end of the Confederations Cup this weekend, demonstraters swarmed the streets of Rio de Janiero in protest of governmental corruption, high bus fairs and extravagent spending on staging next year's World Cup. Police quelled unrest, unleashing a barrage of tear gas and stun grenades at over 5000 protesters. Brazillians are calling this their awakening. My Name is Neirin Jones, I’m 30 years old and I am a British cinematographer living in Rio. In the 11 years that I have known the city, it has changed a lot. I’ve been motivated to go out and explore the city, find people, locations and light. No better opportunity than the protests. I have chosen to use black and white, along with a square format. I was out getting myself a Brazilian mobile when I first heard about the demonstrations. I came out onto the high street and there were thousands of people marching. That was two weeks ago and since then things have just been escalating. Obviously there is the widely reported issue around bus fare, but it’s far deeper than that. The words that have resonated with me most were "I march because what we are asking for is so simple. Better health and education - thats it! I don’t care if it gets violent because what I'm asking for is a right". Perhaps what has moved me the most is the image of a lone, armed policeman stood amongst the motorbike road block with a tear gas back-drop. He looks like a boy to me. There is a sense that he is being told what to do, where to be, but he is also armed and ready for action. He is part of a highly criticised state military police, who influence and control civil society with heavy military arms and extreme violence. I wonder if this police officer is happy with the state of Brazilian education, health and social care. I think the image that best captures the poignant fight is the photograph of the old man smoking a pipe and looking down the street at the aftermath of the violence that occurred just outside his house. Thousands came out in protest that spilled into violence. The government have taken a stance of dismissing them as vandals, discrediting their motives. 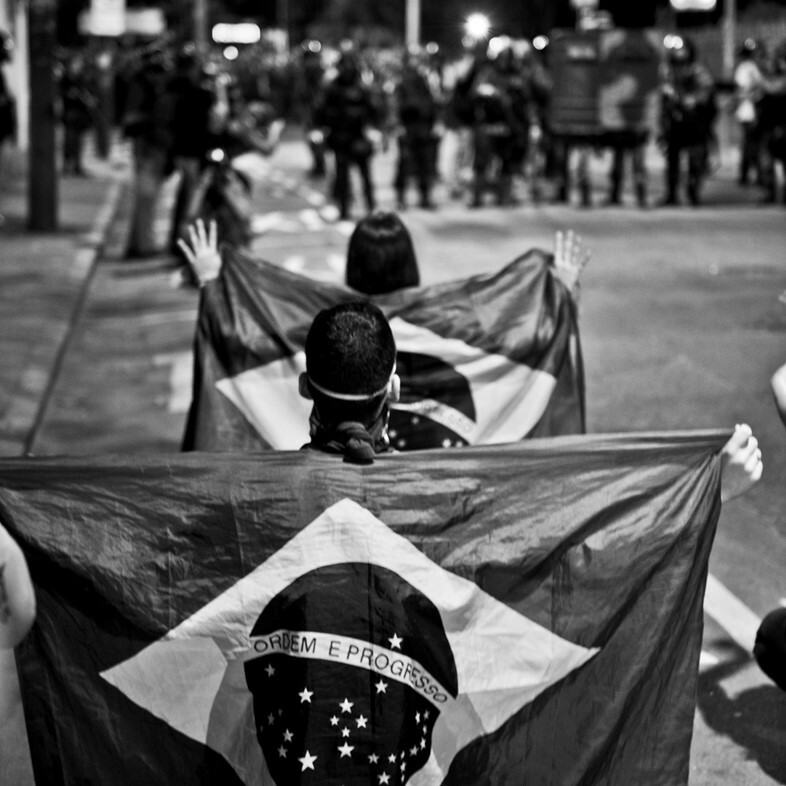 Millions are expected to come out again and show their support in further protest, but the reality is that the majority of Brazilians watch the events unfold in front of their TVs. The real conflict lies in whether they decide this is meaningless vandalism or a cause worthy of support. I honestly don't have a clue how this is going to end. From the people I have spoken to the unrest is deep set. That’s not going away. But neither is the World Cup or Olympics and with the world’s eyes on Brazil for the next few years, there is opportunity for the voice of Brazilians to be heard internationally – that’s a powerful position to be in.